SUBHEAD: Japanese engineer who worked on Fukushima Daiichi Reactor #4 warns against nuclear energy. Image above: Engineer Mitsuhiko Tanaka explains his position. From (http://fukushimaupdate.com/fukushima-no-1-engineers-warning-to-taiwan-nuclear-power-unstable/). A Japanese engineer who helped build Reactor #4 at the Fukushima Daiichi nuclear plant said such plants are inherently unstable, urging Taiwan to ditch atomic energy for renewable resources. Mitsuhiko Tanaka, arriving in Taipei on Tuesday with a delegation of Diet members for a six-day visit, told a press conference Wednesday that the 1986 Chernobyl disaster changed his views on nuclear power. 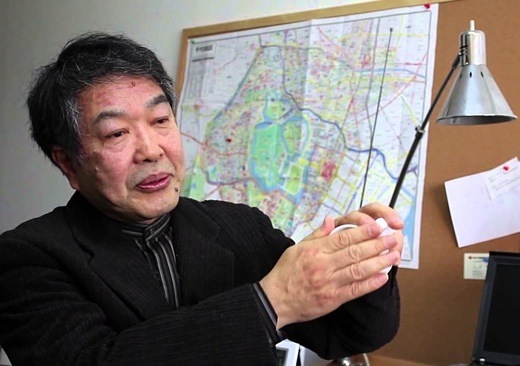 “Nuclear accidents are bound to happen someday, only that we don’t know when they will happen,” he said. Tanaka, who helped build part of reactor 4 while working at Hitachi Ltd. in 1974, quit the company in 1977 and became a writer. He chronicled the discovery of a manufacturing defect in reactor 4, and the subsequent coverup, in a book in 1990. When he went in 1988 to the then-Ministry of International Trade and Industry to report the cover-up, the government refused to investigate it and Hitachi denied his accusations. Little did he know that the manufacturing defect would resurface decades later after the March 11, 2011, magnitude-9 earthquake off the Pacific coast rocked the plant, spawning a tsunami that robbed it of all power and disabled its cooling systems, triggering three core meltdowns. Reactor 4 was shut for maintenance during the crisis but hit by hydrogen explosions and a fire that spread from adjacent units. At the news conference, House of Representatives member Taro Kono joined Tanaka in his opposition to nuclear power. Urging Taiwan’s government to make information publicly accessible, Kono voiced disappointment that Taiwan Power Co., operator of the island’s three nuclear plants, had refused to let the politicians visit one of them. Kono, who in 2009 unsuccessfully ran to become president of the Liberal Democratic Party (and thus prime minister) like his father, Yohei Kono, said his colleagues urged him during the campaign to refrain from opposing nuclear energy. “I hope Taiwan doesn’t repeat the same mistake as we did,” he said. Tanaka and Kono are among the many Japanese who have turned their backs on or ramped up opposition to the nuclear industry since the meltdowns in Fukushima, which forced thousands from their homes. Former leaders Junichiro Koizumi and Morihiro Hosokawa have joined the chorus, challenging Prime Minister Shinzo Abe’s pro-nuclear stance as Hosokawa vies to become Tokyo’s new governor.